The Chinese Crested Dog is the only dog that sweats through its skin. All other dogs sweat through their paws. Free Dog Ecards Over 450 free Dog Ecards, that's right we said free ! Send an Ecard to your sweetheart, a friend or a family member - Ecards are a great way to "spice-up" your emails. Over 202,395 Dog Ecards have been sent so far. Dog Photo Album A special Photo Album where you can post pictures of your own "best friend". You can spend hours looking at other dog lover's dogs, or reading stories about their dogs. Games and Puzzles A Fun and Games section with free Puzzles. 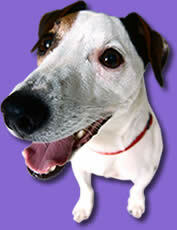 Test your knowledge of the 156 different dog breeds listed at DogBreedz.com by playing Walk the Dog . 156 Dog Breeds Information on 156 different Dog Breeds. Detailed information on every dog breed helps you choose the right breed for your lifestyle. Links Directory A large Links Directory with links to hundreds of Dog-Related Websites . Dog Articles A collection of many Dog Articles covering topics such as medical and safety , buying a new dog, grooming, and dog training. Dog Names Currently we have 14,704 dog names to help you name your new puppy. Dog Lovers Webring We've started a brand new Dog Lover's Webring. Have a website? Then get on board today. Join the webring today. FAQ Section We've recently added a FAQ Section to answer some of those "nagging questions" that you may have regarding DogBreedz.com. Latest Pic in your Dog Photo Album. A brand new Poll every week. Your opinion counts, so take a second to vote. The Chesapeake Bay Retriever is the toughest, hardiest, most strong-willed and protective of all of the retrievers. This breed is well renowned for its unique retrieving skills, one of which is its uncanny ability to mark and remember where a bird has fallen.